» Can Contact Lenses Be Stored In Water? Once you know how to wear contact lenses properly, what is equally important is how to store them. One of the commonly asked questions is whether contact lenses can be stored in water. The answer is "NO". If you have run out of solution, it is advisable to keep the lens in the eye until you can get some. Tap water contains micro-organisms which can contaminate the contact lenses and cause eye infections. There is a micro-organism called "Acanthamoeba" which is capable of destroying the cornea and can even lead to blindness. The resulting infection is known as Acanthamebic Keratitis. At best it is an extremely painful infection, so never take this risk. Other than the infection factor, using water to store soft contact lenses can also cause them to become hard and they will not work properly. You will come across many instances on the internet where people claim that it is acceptable to immerse your contacts in tap water for a short while. Do not take notice of such claims. The reasons why one should not to use tap water as a substitute storage solution have been very clearly explained above. Contact lens storage solution is basically a sterile saline solution, and is specially formulated for the purpose that it is to be used. One golden rule is that the storage solution should be replaced daily. Do not re-use or top up contact lens storage solution. However, always use the solution as per the user instructions as usage procedures may vary from one manufacturer to another. Commercially available contact lens storage solution is sometimes replaced with home made solution. There is much debate about the authenticity of this kind of solution. According to an in an alert in 1989, the FDA addressed both Eye Care Professionals and users. The use of home made contact lens storage solution is not recommended. If at all this solution is used, then it must be used with extreme caution and under stringent control. This solution can be used before or during heat disinfection of contact lenses as any micro-organisms will be destroyed in the high temperature. But under no conditions should it be used after the heat disinfection process. The report also recommends that if home made solution is to be used, it should be prepared daily and solution containers should be sterilized on a weekly basis. Listed below are some basic tips on how to store contact lenses correctly. If you follow these easy procedures, you will be guaranteed to have a long and healthy relationship with your contact lenses. Use the contact lens storage solution which has been prescribed by your doctor. The choice of solution will have been made on the basis of your eye sensitivity and exact kind of contact lenses which are prescribed. Always wash your hands before touching your contact lenses. Avoid moisturizing soap and dry your hands with a lint-free towel. Also avoid touching your contact lenses with fingernails. Keep your contact lens storage case clean at all times. It should be scrubbed and soaked in hot water daily (about 70°C) and then air-dried. 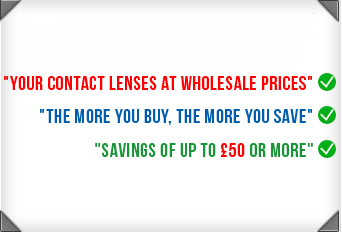 Replace both contact lenses and their storage case regularly as recommended by your optician. Always replace the storage solution in the case each time you store your contact lenses and never top it up. This way the solution is always sure to be fresh. Never let your contact lens dry out. Always store the lens in the correct storage case i.e., the right lens in the right one and the left one in the left case. Never use tap water to wash your contact lens or storage case. Do not retain disposable contact lenses for any period longer than prescribed. Contact lenses should be stored in the correct storage cases and with the recommended storage solution. If care is taken to follow the steps given here, then you will never have any problem with usage of your contact lenses. Remember, your eyes are your windows to the world, so look after them well.